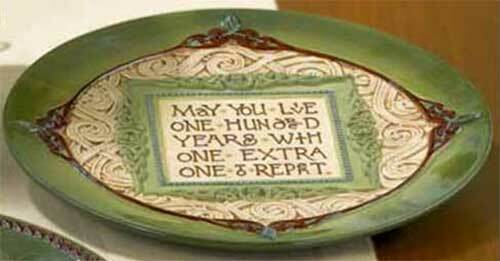 May You Live One Hundred Years with One Extra One to Repent. This Irish blessing plate features Celtic knots along with a dimensional design. The stoneware Irish blessing dish measures 8 1/2" in diameter and the metal display stand is included. This Irish blessing plate is dishwasher and microwave safe and it is gift boxed with a Celtic knot history card that is complements of The Irish Gift House.